This comes as the last wave to the rain-pour of Cherry Mobile releases. After the Stellar and Supreme, once again, Cherry Mobile dishes out its sweetest treat ever as it releases the cheapest dual-sim Android smartphone. The Cherry Mobile Candy and the Candy Chat rock the Android world for just Php 3,699. This is in line with the company’s promise to give “high end products” with a competitive price. Both devices are powered by Android 2.2 codename Froyo. 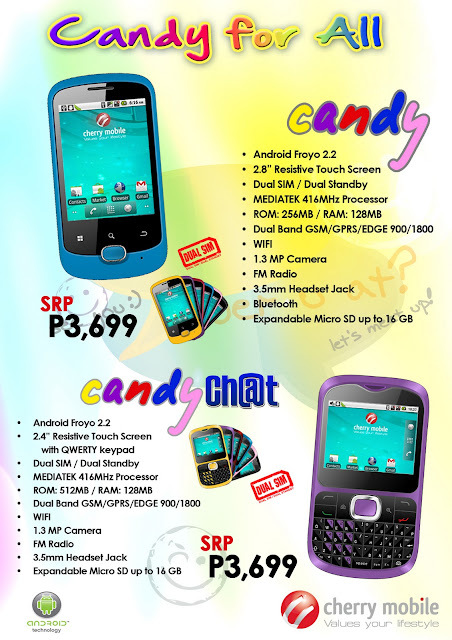 The Candy version rocks a full touch screen capability with 2.8-incher resistive display; while the Candy Chat features a QWERTY keypad with a 2.4 inch resistive touchscreen. Both versions are dual sim/ dual standby; and are expandable up to 16GB. This serves an early Christmas treat for Cherry Mobile fans all over the country, you might as well add these hip and vibrant-colored puppies to you wishlist. This is a good good competition, I like android phones and P3,700 android phone from cherry mobile is a gift to every Filipino. Nice Post. @GbSb TechBlog, yep, we'll just have to give CM a chance, I'm sure it has a lot to offer.